The LED option for Seventy Series display wall line up has environmentally friendly design, flexible electronic setting and extremely long life time to realize more efficient and lower running cost operations for customers. 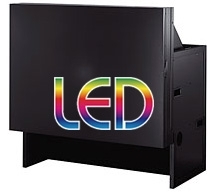 Mitsubishi Electric's innovative Seventy Series LED display wall engine utilizes an optical system which is 100% tuned for LED light source. It is the core of the display wall cube, and the key to the cube's high reliability and picture quality. The brightness and color of all the individual cube modules in a display wall can be adjusted together, dramatically reducing the time needed for installation and setup. The brightness of each individual display wall cube module is automatically adjusted for optimal brightness uniformity from edge to edge across the multi-screen display wall configuration. Equipped with an original LED power control circuit, each display wall cube can be set to operate in one of three modes: Normal, Bright or Eco. As a result, command and control room operators can select the brightness according to the environment and use. Mitsubishi Electric LED display wall cubes have multiple picture settings, giving customers the freedom to choose the best setting according to the application and content being displayed. Optimized Color is best for reproducing natural-looking colors, Vivid Color realizes more striking colors in icons/symbols, and Low Color Temperature is ideal for backdrop applications in broadcasting studios. With its modular concept, the Seventy Series LED display wall system is feature-packed and totally customizable to match a customer's exactrequirements. Available screen sizes include 50", 60", 67" and 80" for 4:3 models. For the wide-format models, there are 62" (16:10), 70" (16:9) and 72" (16:10). The cabinets and screens are the same for both XGA and SXGA+ resolutions, requiring less capital investment for upgrading. The display wall engine has 3 option board slots. The variety of selectable input boards enable flexible configuration to suit a customer's exact requirements. A number of screen options are available, including Mitsubishi Electric's proprietary high gain "black-stripe" anti-glare screen, middle gain cross lenticular screen and low gain black bead screen designed for control room applications. Using no external processor, 4 windows for video, DVI/VGA or SDI can be shown on each display wall cube module (6 windows if there is no ‘desktop’ image). Large windows can be distributed across a display wall using a daisy chain card or by signal distribution. The user-friendly graphical interface of the D-Wall Software Site controls the windows and wall layout. Each display wall cube module has 3 built-in sensors (R/G/B) and an autonomous brightness and color balancing system. No external computer is necessary for adjustment. The sensors continually monitor the brightness and color, sharing the data with adjacent units to automatically adjust overall performance to achieve extremely accurate color balance and brightness over the entire display wall. Based on extensive R&D, Mitsubishi Electric successfully developed machine-vision software for automatic motorized 6-axis adjustment. Employing an external digital camera, this revolutionary software system greatly reduces the amount of time and skill required for mechanical alignment of the display wall cube modules during installation and maintenance. Automatic color alternation using Mitsubishi Electric's “Wallaby” software saves additional time during installation and maintenance. A LED light source has an average service life that is approximately 10 times longer than that of conventional ultrahigh-pressure mercury lamps. Combined with the 100,000hr, ultralong service life of our fans, the average service life of Mitsubishi Electric LED display wall cubes is close to 10 years, even when operated 24/7. *Service life figures not guaranteed. The system has an optimal airflow path and cooling module design that are perfectly matched to the characteristics of the LED light source. *The cooling module consists of a highly efficient cooling pipe and aluminum plate. The LED light source eliminates the use of mercury, and thus helps to preserve the environment. At the same time, the Eco mode setting contributes to lower power consumption and CO2 emissions than display wall cubes that use a conventional ultrahigh-pressure mercury lamp. The Seventy Series ‘Smart Switch’ function delivers the signal redundancy required for mission critical command and control room operations. If a signal is unexpectedly lost, the display cube module automatically switches to an alternate signal source within seconds, greatly minimizing downtime.